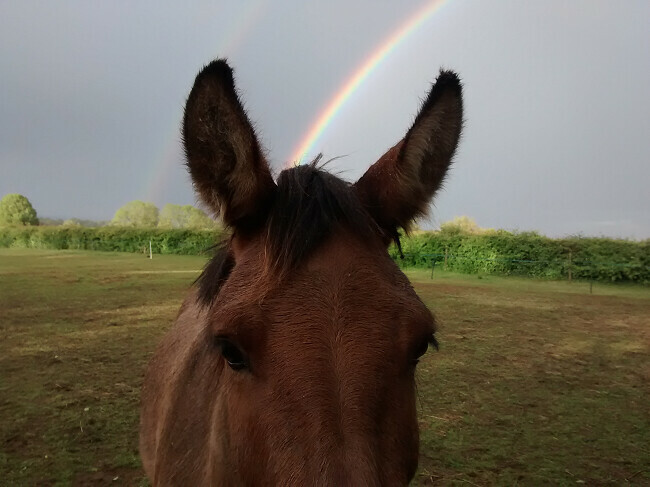 I keep putting off updates because I feel like I don’t have much to write about; this is in part due to the fact that I am not being very proactive at the moment when it comes to mule training. Health-wise I’m running on empty a lot and, although I would like to use my meager supply of energy on mule stuff, practically I need to use it to do things like go to work and earn money to pay for the mule! He needs to be kept in the luxury he is accustomed to, after all. When I do work with him, I’ve been adopting a more piecemeal approach. He’s very much a latent learner, so I often find that if I do a little bit of work on something – and finish in a good place – he will go away, think about it, and almost always start immediately in that good place when I next ask him. 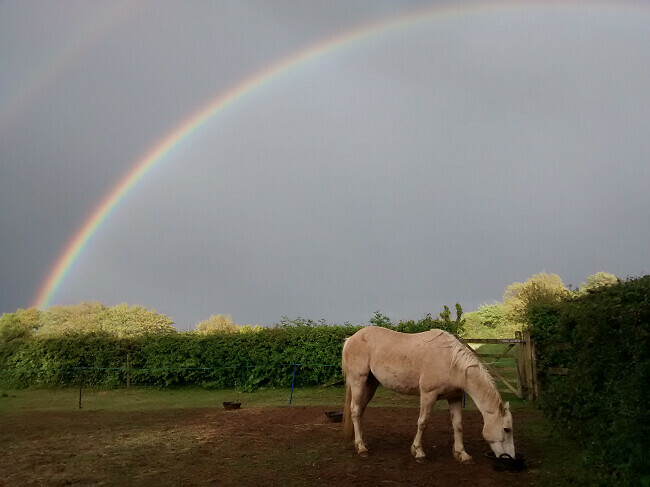 The treasure at the end of the rainbow. I’ve also been doing a lot of thinking in regards to contacting a mule-specific trainer to help me out. 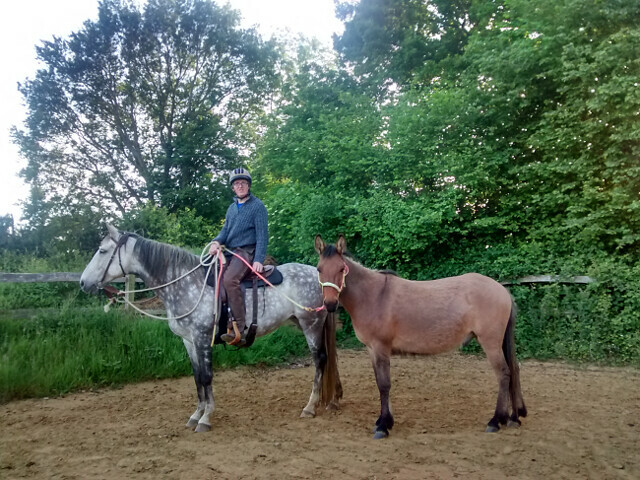 This is easier said than done in the UK; we have a very limited supply of good horsemanship trainers, and finding anyone with experience in mules is another level entirely! Mostly, I guess I just want someone who knows what they’re looking at to come and see Marty and let me know if his reactive behaviour is normal and if I’m on the right track with him. Ben has been in contact with his mentor, Steve Halfpenny, who is coming to the UK this summer and may – if we’re lucky – be able to drop by and meet Marty. In the meantime, he’s had a look at some videos of us and given some good advice on handling and how to proceed. Cash is a very slow eater, so I have to hang around and guard him from marauding mules. He made for a nice picture on this rainy evening. One of his suggestions is to pony Marty, which Marty appears to find terribly boring but is getting better at. On his first session he hung back a lot, trying to walk nose-to-tail behind Iris (he would make a good pack mule … y’know, if I could get anything on his back and if he didn’t lose his mind over unexpected noises and movement), and dragging on the rope. Ben persevered, ended on a good note, and when we tried again today Marty immediately fell into step and walked round the arena with his leadrope nice and slack. I rolled a scary thing into the arena; Marty takes a break from investigating it to check out Iris’ bridle, instead. We did have a small success last week, when I took Marty up the lane to meet a friend. 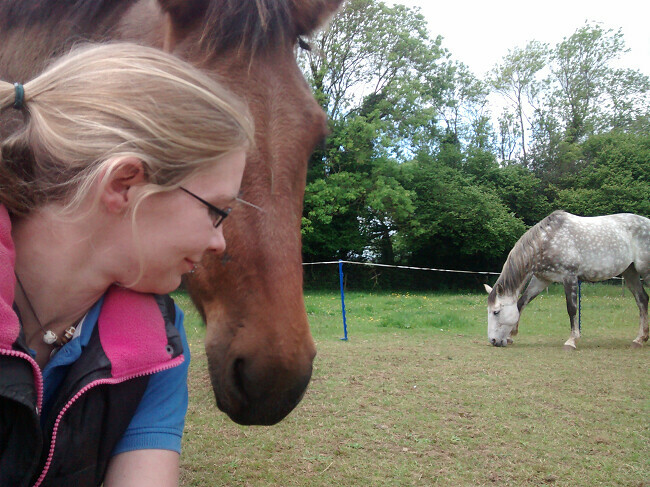 She was booked to look after our herd for the weekend, and as I had to meet her from work and walk back to the yard with her anyway, I figured I might as well take Marty with me. I think it’s useful for him to do little ‘jobs’ like that. It was a very short journey, but not only did it involve him having to walk into a brand new place, my friend had her dog with her – who was very excited and kept leaping up to grab his lead! Marty didn’t bat an eyelid at this and walked with the dog – still leaping about – all the way back to the yard. All the dogs he’s been introduced to so far have been terrier types, so I’m interested to know if the dog phobia was just a passing phase or if it’s the specifically wolfy type of dog that alarms him. Speaking to a friend about the incident, in which I explained my bewilderment about why he would react in such an extreme way when he had been so calm and happy for the beginning of the walk, she suggested that Marty had simply been overwhelmed. I think of it like he has a cup which gets topped up every time he has to be brave: leaving the yard would have filled it a little, meeting the cyclist added a little more, following a new trail increased it further, and then the wild ponies chasing after him – even though he didn’t react at the time – filled the cup entirely. The dogs were just something that tipped him over the edge. I suspect that, had we met them earlier, there would have been no problem at all. So although it’s been a whole month since we’ve been out on what I’d call a proper walk, I do regularly take him for a short jaunt down the lane and back; just to reaffirm the idea that leaving the yard is something he can do. The idea is to gradually build up how much I ask him to deal with until he can handle more and more things without becoming overwhelmed. He’s a handsome little guy, and is starting to look like a real grown-up mule now! This tendency to be overwhelmed is something I’m having to take into consideration when I work with him now. I was aware that mules are stoic by nature, but I didn’t realise quite how much Marty was holding inside. 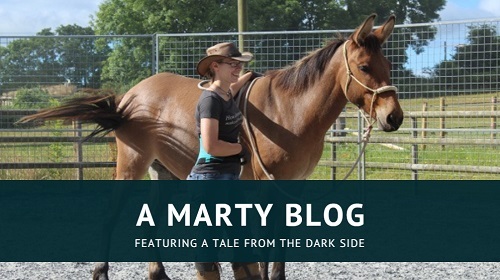 Doing things that I would do with a horse – like walking him around to make sure that he can move his feet and has not simply shut down – are things that don’t always work with Marty. Other than that, he and I are in a really good place right now. 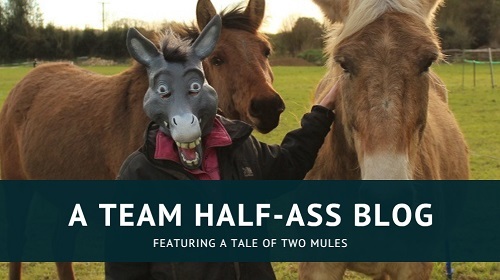 Building a relationship with your mule is so important, and I feel like we’re really getting it right in that respect. 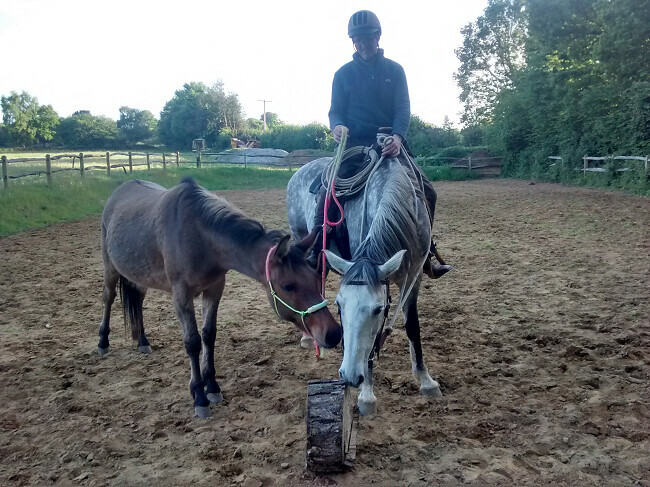 He’s sweet and gentle and will happily hang out with me, perform at liberty in the field and allow his feet to be handled while loose – which, when I think back to how difficult it was to teach him to have his feet touched at all, is a major improvement! Hanging out in the field is always a nice thing to do.